When we recently polled Cakespy readers on which iconic bar they preferred, the blondie or the brownie, we found the results staggering: out of our respondents, 174 vs 49 preferred the brownie. 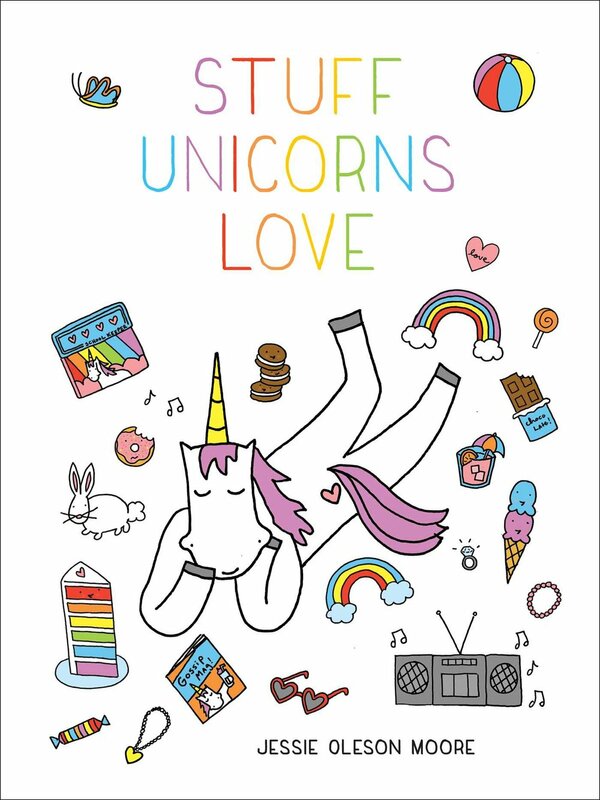 But first things first. What is a blondie? 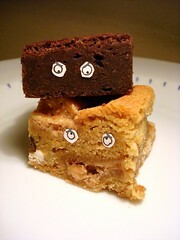 Generally, a blondie is accepted as a type of brownie--but not so much a brownie flavor, more like an identical cousin. An identical, albino cousin. Generally, it uses vanilla or butterscotch base instead of chocolate, and thus has a lighter hue which gives it its name. In our opinion, the finest blondies will have a texture (though not taste) halfway between a cakey and a fudgy brownie: that is to say, delightfully chewy, rich, and dense. 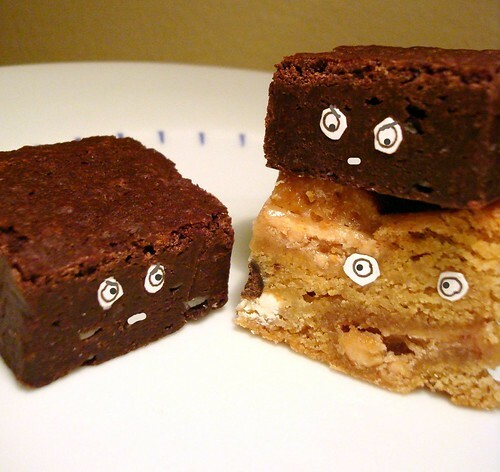 According to old cookbooks, blonde brownies (also known as "Blondies") predated chocolate brownies, though under different names. 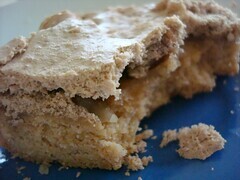 The primary ingredients of blondies (brown sugar/molasses and butter) compose butterscotch, a candy that was popular in America in the mid-19th century. Some 19th century American cookbooks contain recipes that combined traditional butterscotch ingredients with flour and a leavening agent (baking powder or soda). Presumably, these recipes would have produced something similar to the blonde brownies we enjoy today. Furthermore, aforementioned recipes are thought to be descendants of gingerbread cakes which dated back to Renaissance times, which eventually evolved to cakes which were baked in shallow pans and included nuts and brown sugar. 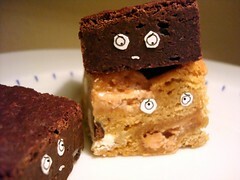 By the 1950s, butterscotch or vanilla brownies were described as "blonde brownies," underscoring the primacy of chocolate. Aren't you starting to feel a little bit for the dear blondie now? Blondies, the taste of chocolate chips in: Because of the lack of chocolate in the base, it is our opinion that the addition of chocolate chips is better appreciated in the blondie--while we certainly wouldn't say they detract from a brownie's taste (oh, not at all), the contrasting flavor that they add to the blondie's mellow butterscotch taste is beyond compare, each little chocolatey morsel a pleasant surprise and miniature treasure for the tastebuds. Blondies, lack of frosting atop: With brownies, it seems as though there are two primary types--dense, fudgy, moist brownies, which usually remain unfrosted--and more cakey, slightly fluffier versions, which sometimes have frosting. As much as we love frosting, we have to admit that some frosted brownies make us just a little bit suspicious--like they've got something to hide perhaps? However, we have never before seen a frosted blondie. Naturally, the only conclusion to be drawn is that our dear blondies have nothing to hide. (Cakespy Note: Naturally, when we make some bold statement soon about how everything benefits from the addition of frosting, we expect to be called hypocrites). Blondies, the color of: Now, don't get us wrong, we love brownies. But regardless of deliciousness, they're not always the cutest-looking treats: dark, lumpy and not very exciting in palette. Not that this stops any of us from enjoying brownies, but we're just saying, the warm golden hue of the humble blondie is definitely more welcoming, and far cuter. Want to make some awesome blondies? Well, here are some recipes that we love. 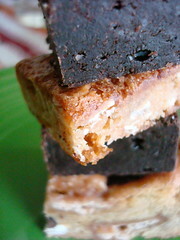 If you, like Thursday Night Smackdown, believe that blondies, "should be a brownie counterpart, which means a brownie equal - rich, moist, chewy, flavorful bars, not cookie-like or overly fluffy...the fudgy texture of a brownie sans actual fudge"--then you should check out their great recipe here. Or perhaps you'd like to explore adding coconut to your blondies? Check out the delicious variation at ReTorte. If it sounds good to you to have blondies that are "denser than chocolate chip cookies, more complex than brownies and in the classic Minimalist style" that you can "customize anywhere from a cranberry almond coconut bar to...gunky atery-cloggers"...then it sounds like you'd better check out this one by Smitten Kitchen. (Photo Left) If you feel adventurous and want to try a blondie derivation, why not acquaint yourself with the mudhen bar, a sweet which is Southern in origin, a meringue-topped blondie-esque confection that we've recently fallen in love with? As for our final word? Well, we realize that we may not have turned you into blondie devotees. Certainly brownies are packing in more ways than one: they're classic, they're iconic, they're nostalgic--and, most importantly, they're delicious. However, we do hope that having learned more about the dear blondie and its plight, you'll give it another chance--because if nothing else, just like it's not easy being green, it can't be easy to be the brownie's albino cousin.